As a result from the #ShareYourExperience competition, read from student volunteers, what they have gained through volunteering, what challenges they have overcome, what impact their volunteering has and what their best memory is. Last academic year I took part in Right to Read. This scheme was aimed to improve young people’s readings. I worked in a struggling school in Coventry with eleven to fourteen-year-old pupils who had reading ages ranging from age twelve to just age five. I was shocked at how low some of their levels were but quickly began to understand why. Reading didn’t seem attractive and often their parents worked long hours and did not have the necessary time to sit down every night to read. 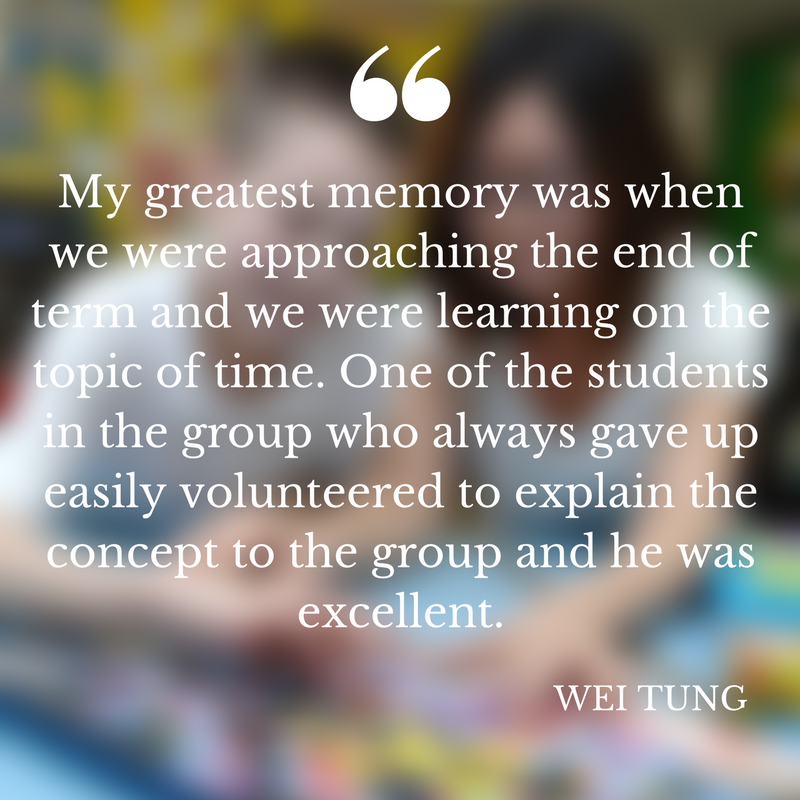 It was difficult work as largely they were unwilling to read and many had learning difficulties but every week for 4 hours we sat and worked with them one-to-one, listening to them read and trying to engage and positively reinforce what they got right. The improvement just week to week was phenomenal and their enthusiasm grew exponentially. The joy when they came to tell us they got 10/10 on a test was so great and although they probably only wanted the chocolate reward, we felt like we’d really made a difference. It was inspiring and fulfilling to see them improve so much, made better when their parents wrote to say how proud they were. 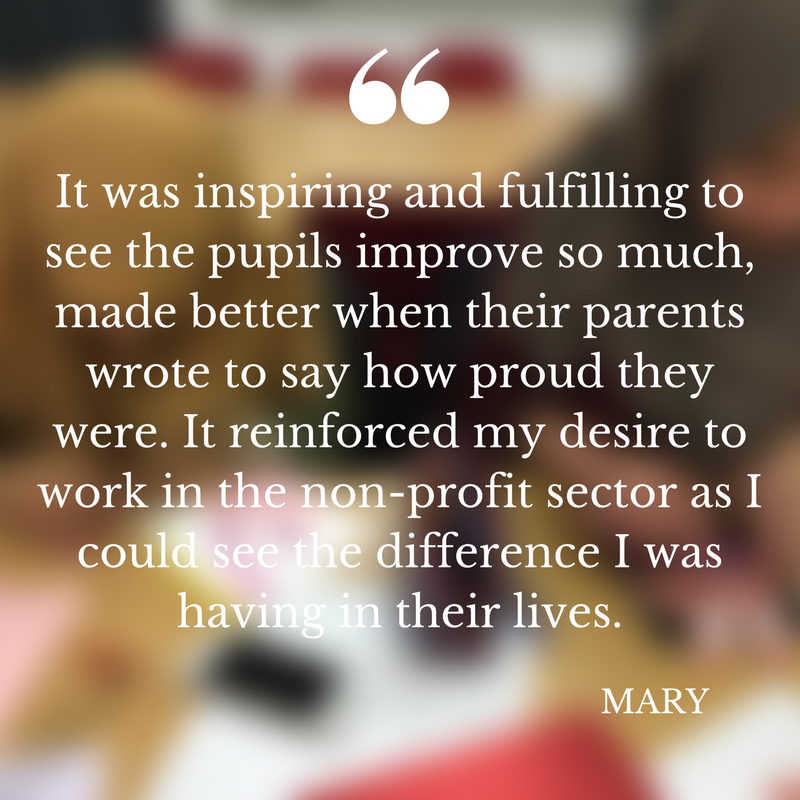 It reinforced my desire to work in the non-profit sector as I could see the difference I was having in their lives and it made me understand the differences in society and how I could help even in this seemingly small but crucial part of their life. During my first year, I decided to join Student Tutoring, helping a Year 6 assistant teacher in Mathematics for Hearsall Primary School. It was quite a challenge as an international student as I was not familiar with the education system in the UK. Nevertheless, I was passionate in teaching Mathematics and decided to take up the challenge. The class was divided into 4 groups and the teacher would assign me to the same group, which were the students incapable of catching up with the others in class and scoring below average in tests. As the students were solving the worksheets, I often had to give them extra support and explanations. It was tricky as they could not understand my explanations. However after rephrasing and brain storming on the simplest way possible in explaining the basic concepts, they started to grasp the idea and could proceed with the solutions. My greatest memory was when we were approaching the end of term and we were learning on the topic of time. One of the students in the group who always gave up easily volunteered to explain the concept to the group and he was excellent, despite being shy initially and I had to give him extra encouragement. He did not choose to keep the extra insight to himself but decided to share with his friends, which I could see the spirit of volunteerism and was immensely happy with his progress. Overall, I have learnt to be a better communicator and confident when presenting my ideas, as well as being patient when the other party did not understand at the first go. 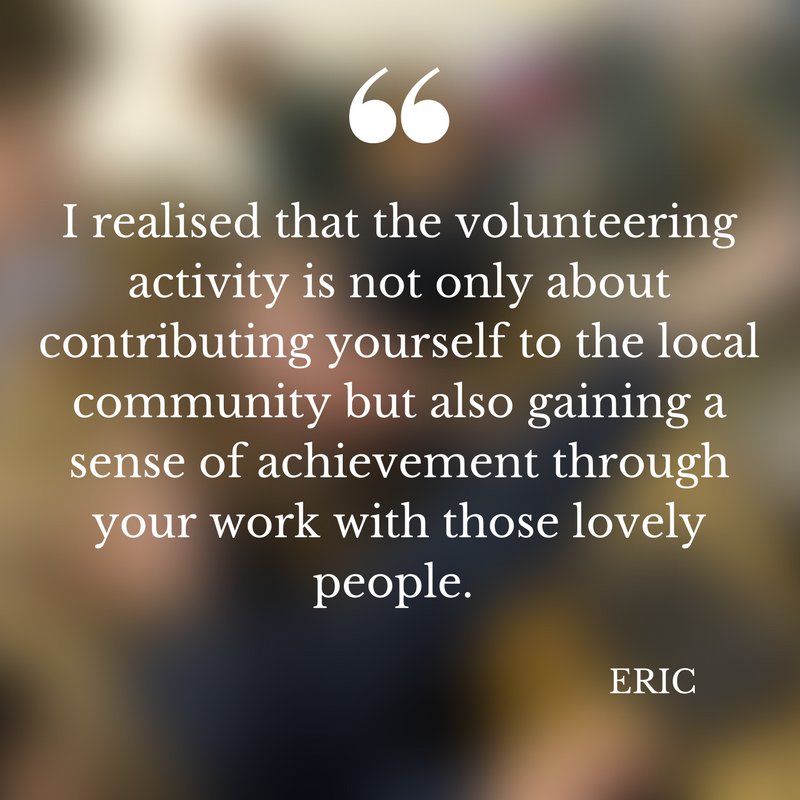 Volunteering has impacted my life greatly seeing the smiles on the children’s faces and their passion for learning kept the spirit going, spreading cheer and joy in the local community. For the second year now, I volunteer weekly as an assistant Spanish teacher for Years 7, 8 and 9 at a local secondary school in Coventry. Over the years I’ve developed strong teacher-student relationships with individuals from each class, and I’ve been lucky enough to witness their improvement over time. During lessons, I take the role of helping those who have missed lessons, or tutoring particularly struggling students. I’ve recently also started to lead short activities myself such as simple speaking/listening tasks with the whole class. In the event of the main teacher being absent and there being a cover teacher, I hold a larger responsibility since I’m the sole Spanish-speaker. Over my time at the school, I’ve been able to notice the tangible impact I make. In a class of 30 students, a single teacher struggles to deal with behaviour issues, thereby leaving little time for the primary goal: teaching Spanish. When I am there, as a team we are able to better deal with behaviour and together we can engage more students to learn. One particular Year 9 student I’ve worked with over time has showed notable improvement. Only 5 months ago when I met her, she struggled with behavioural issues and could only work with present tense. Over the academic year, I’ve sat separately with her and helped her during lessons (with the aid of the main teacher’s support) and this week, for example, she successfully understood and used two new tenses in a basic conversation. Although this is just one example, I am sure that having just one extra teacher to help guide students and take pressure off the main teacher has been essential in their development - and it has been inspiring to witness this. I love what I’m doing, especially since I can see tangible improvements. This not only gives me a feeling of satisfaction and value, but I know how grateful the teacher and students are too. 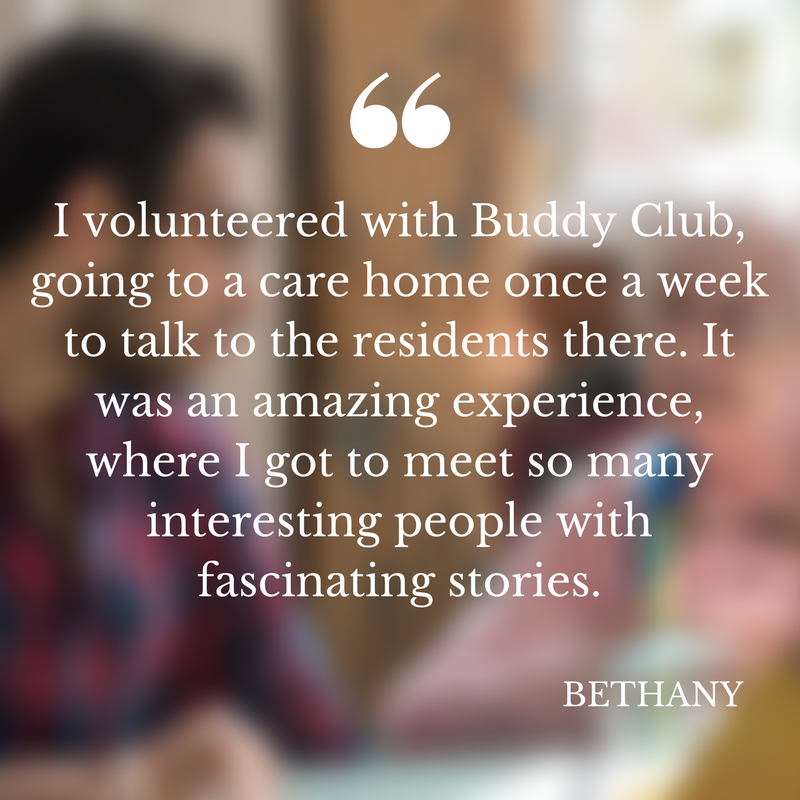 I volunteered with Buddy Club, going to a care home once a week to talk to the residents there. It was an amazing experience, where I got to meet so many interesting people with fascinating stories. Most of them had lived in England through WWII and had shocking stories about being evacuated or attacks on their towns. It was so inspiring to hear how they found the positives in these situations, and made me realise how lucky I am to live in our current time, and how easy I’ve had life so far. Another man, who I spoke to the most, was from China and had incredible stories of how he travelled across the world before ending up in England and opening a chain of restaurants. A lot of the residents didn’t have many visitors, and Buddy Club coming in was one of the highlights of their week. It was such a rewarding experience to know I was making a positive difference to their weeks just by spending a few hours of my time to listen to their stories. The change between being a French high-school student last year to a tutor now may seem rather abrupt, but I had such a good experience that it was really easy and thoroughly enjoyable to become a tutor, I haven't regretted my decision for a single second. 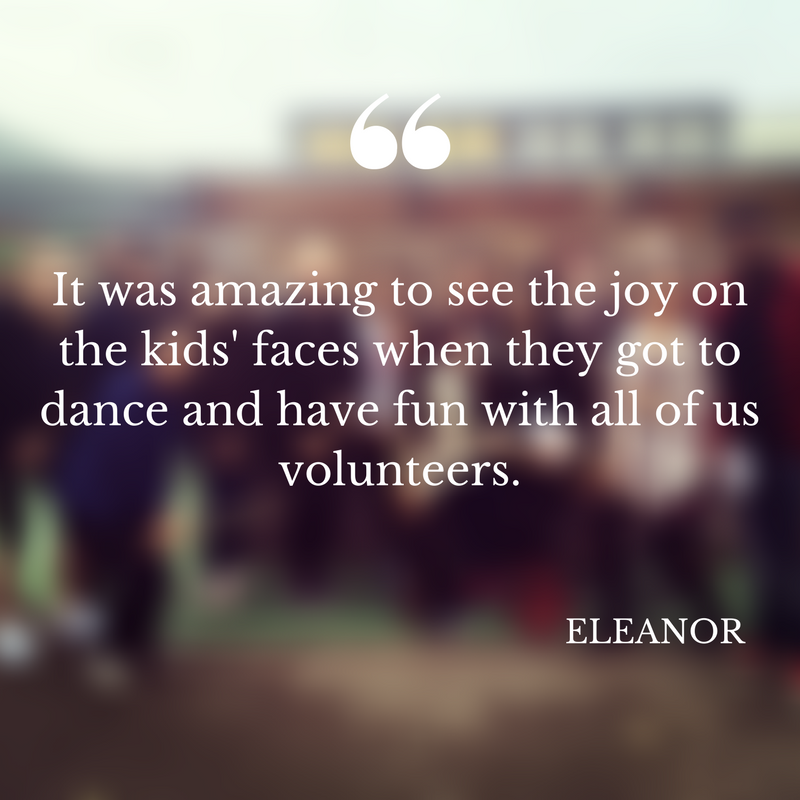 At the beginning of the year, when I saw the opportunities for volunteering, I did not hesitate: I knew I wanted to do that. I was sure it would benefit everyone involved, plus I love being with children. The biggest challenge of all was definitely the language. After only two months and a half in England, when I started volunteering, I was clearly not yet at ease in this language that I had only studied at high school. I feared I wouldn't understand the teachers or pupils, the way I don't always fully understand native English. Actually, it ended up not being a problem at all! I'm so happy to help pupils with both my voluteerings! I listen to 4-year-old reading and I help in the Year 10 French classes. I know my impact is not huge, it will probably not make a difference in their studies. But I'm here to listen to them, to help them, to show that we care about them and their studies. Thought tutoring in a foreign language was a big challenge, I realised it was okay, I could still help children. Every week, I know them more, I remember their names, the way they work, their difficulties, and more importantly: their successes. I'm here to support them and I just hope it helps. I might not have a big impact on them, but being supported can make a huge difference in a child's life. The opportunity to volunteer with Phab has been truly rewarding, and something I honestly never expected to experience at my time at Warwick. Being a Lloyds Scholar I knew that my time at university would involve me helping the local Warwick/Leamington/Coventry community, but the extent to which my volunteering has touched me is something that has come as somewhat of a surprise. Every Wednesday I have come to look forward to setting up the hall ready to see who will attend that week’s clubnight. Getting to see the same children each week, hearing about what they’ve been up to since the last time I saw them, and most importantly watching the friendships between regular members has become the highlight of my week. One of the most rewarding aspects of volunteering at Warwick Youth Phab is getting to watch the children create art that they are proud of and to see how happy and excited some of them become when they see the result of their time and effort that evening. 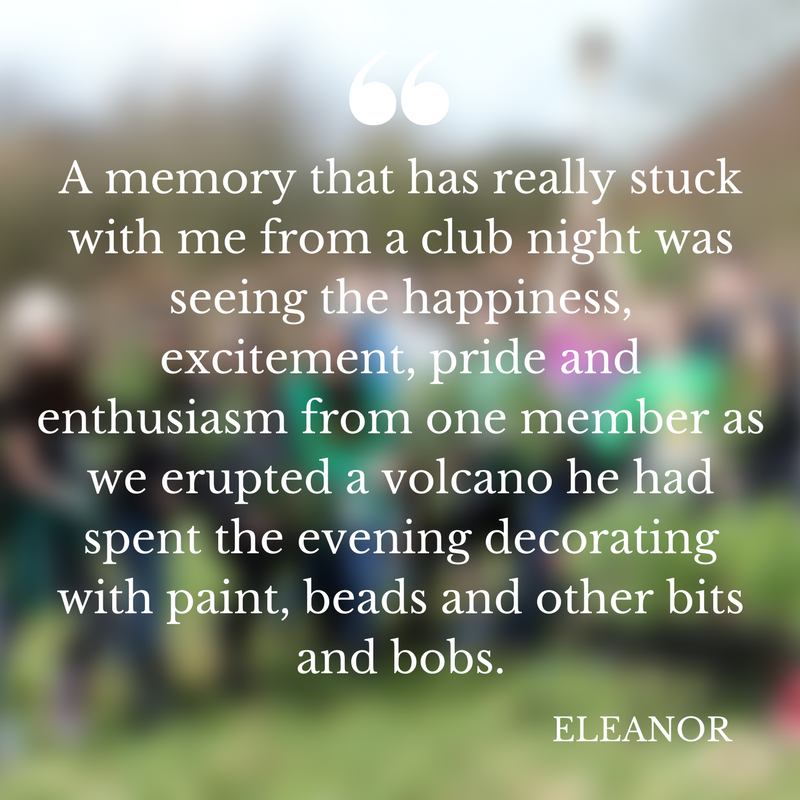 A memory that has really stuck with me from a clubnight was seeing the happiness, excitement, pride and enthusiasm from one member as we erupted a volcano he had spent the evening decorating with paint, beads and other bits and bobs. I am beyond grateful that I was introduced to Phab within the first couple of weeks of Term 1, and have been involved with ever since. It is an experience that has enriched my time at university far more than I really thought possible. A few months ago I started volunteering for children and adults with disabilities (Warwick youth Phab and Kenilworth Phab). My intention was to offer a bit of fun time to those people. 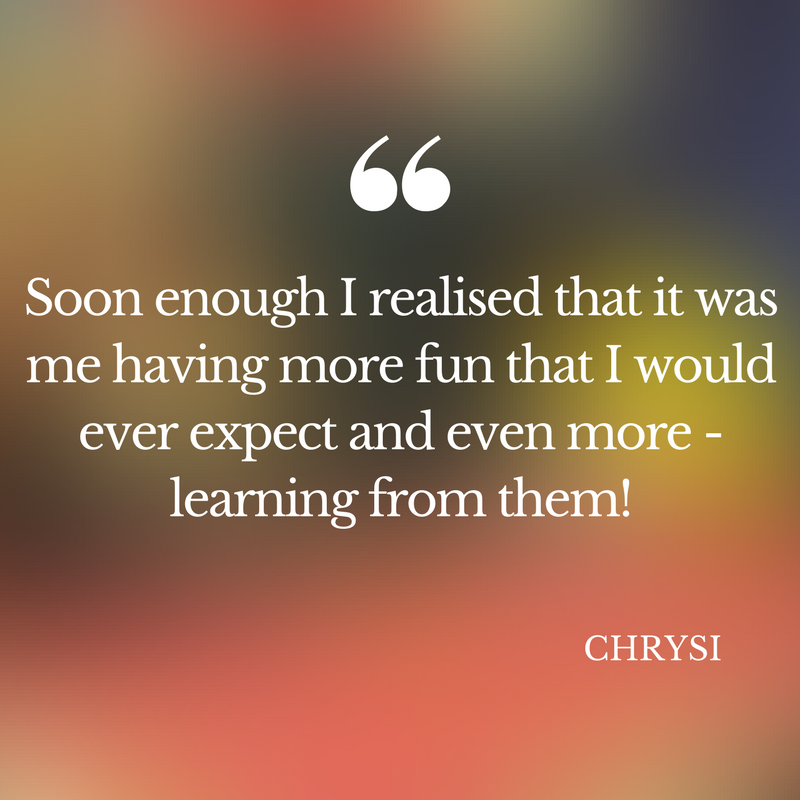 Soon enough I realised that it was me having more fun that I would ever expect and even more - learning from them! It takes no real effort to be around them and discuss or play with them, but it takes more personal effort to see beyond that and to realise that as much as you are helping them, you are helped by them. These people, no matter the age, taught me that my focus was on the wrong things. They are full of life and will and despite their disabilities they have a lot less burden on themselves than me. They have learned to do whatever makes them happy and accept no limitations. I was astonished seeing so much respect and love for everybody no matter how they look like or behave. They learned to not care about what people think of them, something that most of us have not achieved yet. So those people, children and adults, gave me lessons for life! They taught me what kind of person I should be, what weighs me down and I should leave back in order to be free and happy, but mostly how to love people and life! I am more than thankful for being around them, and I am sure I still have a lot more to learn from them!